Prototype: 6 different design express train passenger cars painted and lettered for the German Federal Railroad (DB), for the Interzone train D 455 from Frankfurt/Main via Fulda, Bebra, Gerstungen, Eisenach, Erfurt, Leipzig, and Cottbus to Frankfurt/Oder. 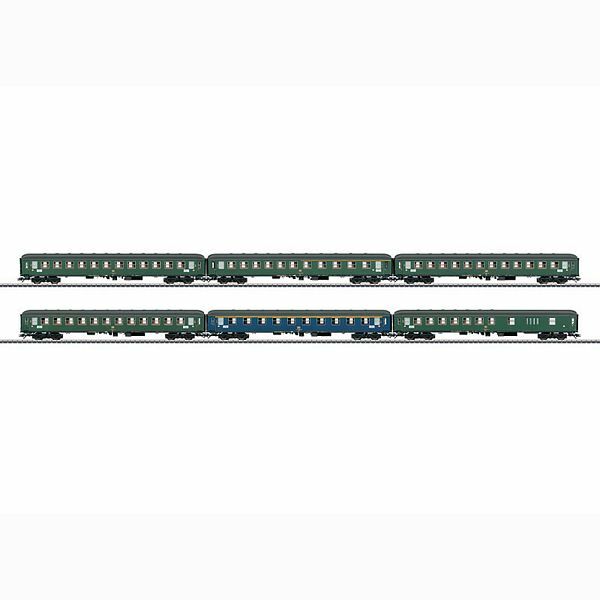 3 type Bum 234 compartment cars, 2nd class. 1 type ABum 225 compartment car, 1st/2nd class. 1 type BDums 273 half baggage car, 2nd class. 1 type Aum 203 compartment car, 1st class. The cars look as they did around 1975. Model: The minimum radius for operation is 360 mm / 14-3/16". The cars have type Minden-Deutz heavy trucks with a reproduction of brake shoes, and generator mechanisms. The 7319 current-conducting couplings or the 72020/72021 current-conducting operating close couplers as well as the 73400/73401 interior lighting kits (2 per car) with the 73406 pickup shoe, and the 73407 marker light kit can be installed in all of the cars. All of the cars have train destination signs and different order numbers for the train composition. Total length over the buffers 170.2 cm / 67". DC wheel set per car 4 x 700580. The Interzone express train passenger car set is being issued in a one-time series for the 25th anniversary of the reunification of Germany. The class 01.5 express steam locomotive as new tooling is ideal to go with the 42912 Interzone express train passenger car set. The locomotive is also being offered under item number 39206 in the Märklin assortment.